Click here to open our online catalogue. IDEO is proud to grant access to its library to all scholars. This library is considered one of the best in the field of Islamic studies. It gathers over 150,000 monographs, and nearly 1,800 journals and periodicals. 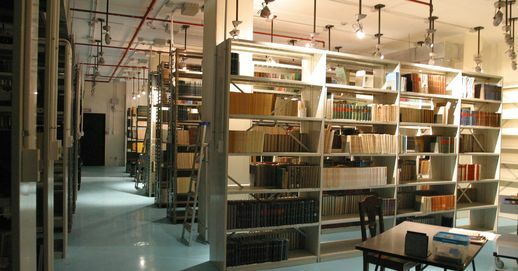 The library is intended to cover all disciplines in the Islamic studies area: Arabic language, Quran exegesis, theology, law and jurisprudence, history, philosophy, Sufism, science… It offers more than 20,000 classical texts of the Arab-Islamic heritage, but also many studies in Arabic or European languages. Many PhD dissertations are also available on site. The library also offers its readers free consultation of the digital libraries JSTOR and Cairn. The library collection is available through our online catalog. In order for the data of the Arabic heritage to benefit from all the possibilities offered by recent technologies, our software Diamond-ILS is evolving! You can now access a new generation catalogue (FRBR standards), displaying richer data in a more efficient way. The library is open to the public on Tuesdays, Wednesdays, Thursdays from 9 a.m. to 5 p.m and Fridays from 9 a.m to 7 p.m. Check the online calendar. The library welcomes students and researchers from the master level. Readers receive the books they had requested at their tables. Any consultation is done on site. The annual registration fee is 50 EGP. A simple ID or passport is enough to register. Photocopies are charged 0.30 EGP per A4 page (maximum 60 A4-pages per week, 30 A4-pages per monograph, no complete book). Photocopies are delivered the following week. The library is at the Dominican Priory, 1, al-Ṭarābishī, al-ʿAbbāssiyya, Cairo (Metro station el-Geish). Absolute priority is given to classic texts of the Arabic culture, especially in the areas of religious thought, language, philosophy, theology, mystics, general history, geography and sciences. We try to acquire all of the ancient Arabic texts published within the whole of the Muslim world, from Morocco to India. Add to these, those published by Orientalists. Among contemporary Arab authors, priority is given to studies on the current religious evolution of the Muslim world, with all its social, cultural and political consequences. This priority however does not exclude that serious attention is given to contemporary Arabic literature and to political analyses on Egypt’s current political situation within the framework of the Middle East. Catalogues of Western publishing companies are systematically checked for the acquisition of outstanding works in different fields of Orientalism and in fields related – closely or remotely- to Arabic culture (for example, texts and studies on the history of sciences, of philosophy and theology, in the Greek, Latin, Indian or Hebrew traditions). Moreover, for research on interreligious relations, working tools in Theology, Exegesis and Patrology are carefully updated. Selected works are acquired in different areas, according to the needs of the Institute’s members or to suggestions made by our readers.